Spain may be a pork lover’s paradise, but vegetarians traveling in Spain needn’t worry. There are plenty of meatless options for vegetarians if you only know what to order. The following Spanish foods are some of my favorite vegetarian dishes and most are easily found in bars and restaurants throughout Spain. Vegetarian food in Spain is more common than people think– so read on! This has to be one of my favorite vegetarian tapas in all of Spain. The trick is to parboil the carrots so that they are just tender, but not at all mushy. Then it’s just a high-quality extra virgin olive oil, vinegar, garlic, cumin, and other herbs and spices. A day or two in the fridge only adds to their flavor. 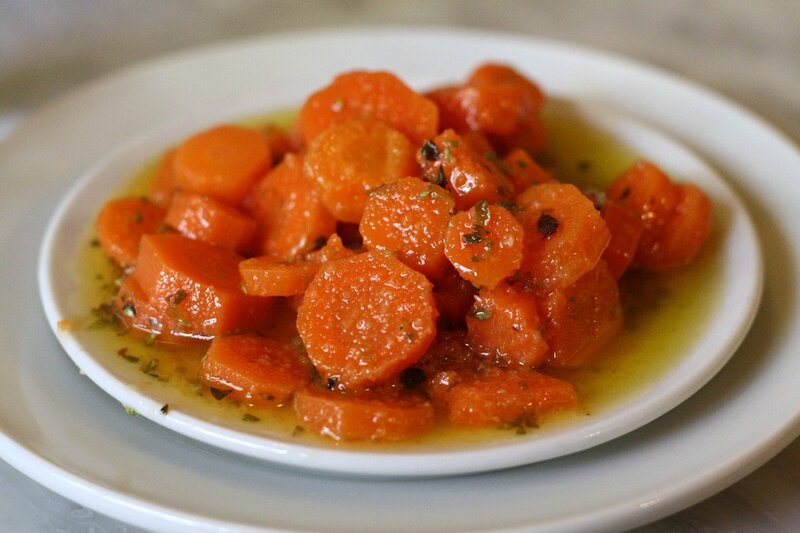 Check out this delicious marinated carrots recipe. This potato omelette is one of the most representative dishes of all of Spain and it also happens to be vegetarian. Consisting of olive oil, eggs, potatoes, and (often debated) onions, this is a Spanish food that it seems everyone in Spain knows how to make and loves to eat. Whether for lunch, snack-time, or dinner (but not breakfast! ), served hot, cold, between bread, or with ketchup and mayonnaise, a slice of tortilla is always a safe choice! 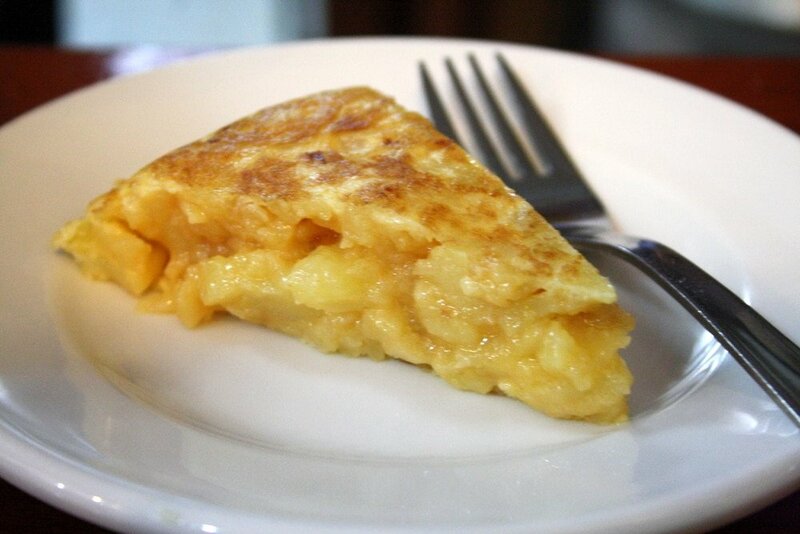 Get the best tortilla de patatas recipe here. Don’t get scared by the word calamares in the title. The name is this dish is a clever joke. 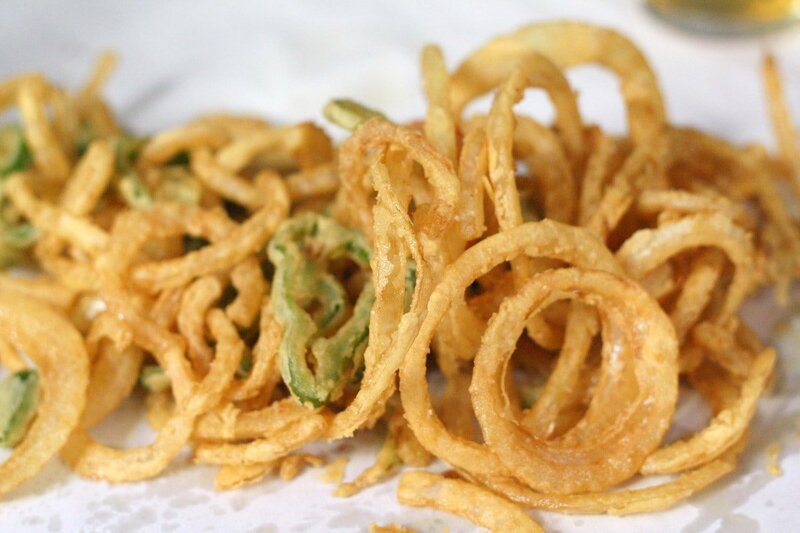 Consisting of onions and peppers cut into circles (like calamari rings) and then deep fried, calamares del campo are simply fried veggies and definitely vegetarian-friendly. 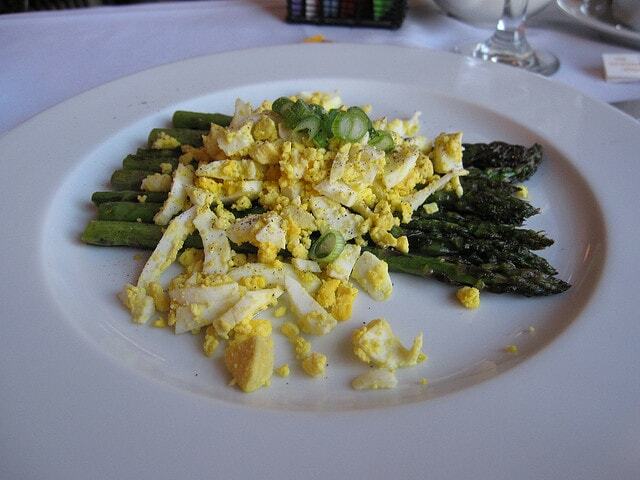 This popular plate around Spain is a great combination of local asparagus and eggs prepared a variety of ways. I personally like it with a poached egg and some jamón… but for the vegetarians out there the poached egg alone will be delicious! A version with hard boiled egg. Gazpacho is originally from Andalusia, although Spaniards throughout the country enjoy it year round (ask anyone and they’ll tell you it’s the BEST hangover cure on the market!). 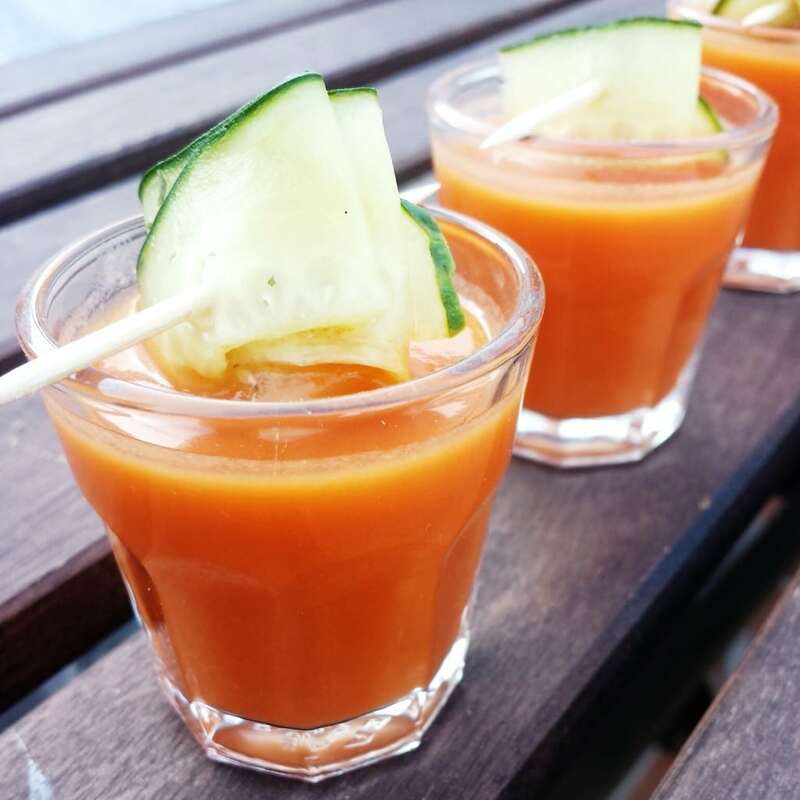 Whether eaten in a bowl as a cold soup or sipped from a glass like vegetable juice, gazpacho is a super healthy and refreshing vegetarian Spanish food. 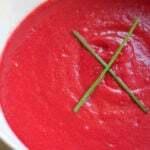 Take a look at my favorite gazpacho recipe. This wonderful combination is one of my favorite Spanish dishes. I don’t make it nearly enough but it is actually really easy and super healthy. Check out this amazing version that made my Spanish husband nearly cry tears of joy! 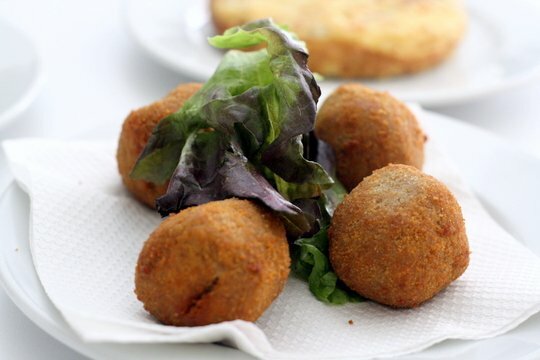 Blue cheese and walnut croquettes. Just writing about this dish makes me hungry! Imagine an eggplant, cut super thin and fried until perfectly crispy. Then, it’s usually covered in a drizzle of local honey or served on top of salmorejo— a thick tomato soup. This recipe is fantastic– one of the best vegetarian tapas recipes hands down! 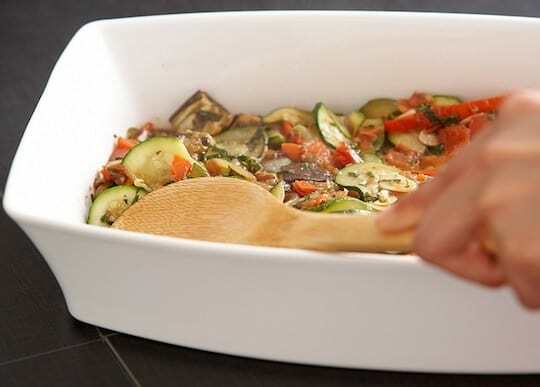 Pisto is basically roasted vegetables (onion, pepper, eggplant, and tomato) that are then lightly pureed into a chunky sauce. Spaniards fry an egg to their liking and plop it on top. Visually stunning? No! But delicious, healthy, and vegetarian? Yes! 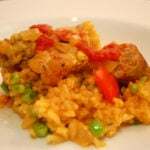 Try the recipe for pisto’s “cousin”, a delicious Mallorcan dish called Tumbet Mallorquin! Ajo blanco is another cold soup originating in Andalusia (go there in the summer and you’ll realize why they have so many cold soups!). It is a creamy and delicious blend of almonds, bread, EVOO, garlic, salt, and water. It’s usually served with grapes or melon cubes on top. It’s completely different than anything I can think of, but it’s really delicious and worth a try while you’re in Spain. And, if you’re wondering, the garlic flavor is not too strong! Ok, so this isn’t only Spanish and you’re probably asking yourself why I would include it. 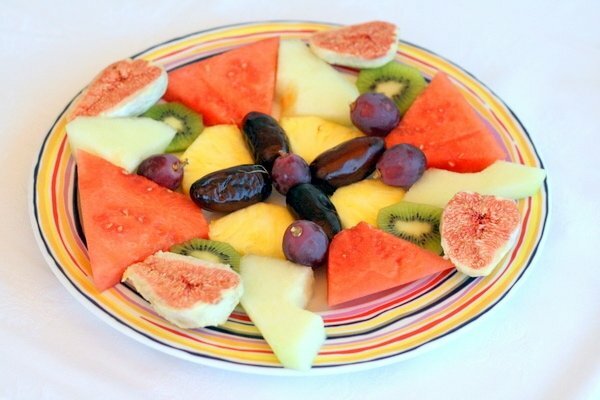 Well, here in Spain many restaurants have fresh fruit on their printed menu as a dessert option. Depending on the season I’ve seen mandarin oranges, watermelon, green melon, peach slices, strawberries and cream, and grapes. You might think you’d prefer a slice of cake until you try the fruit! I’m always shocked at how delicious seasonal fruit is here. It (almost) deserves to be called a dessert! If these 11 vegetarian options aren’t enough for you here in Spain, don’t worry! There are plenty more vegetarian dishes like these that I’ve tried recently: revuelto de calabacín (scrambled eggs and zucchini), tostas con queso brie y mermelada de frambuesa (toasts with brie and raspberry jam), or torre de berenjenas con queso mozzarella (tower of grilled eggplant and mozzarella cheese). UPDATE! 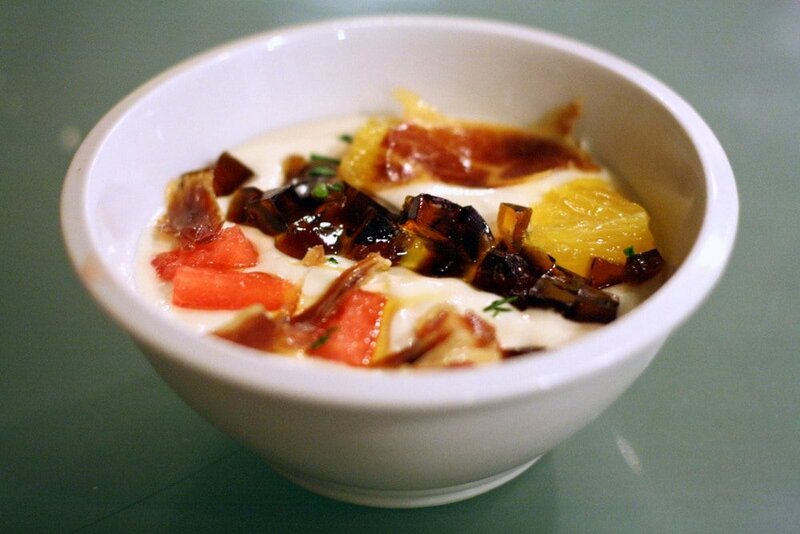 See our list of Vegetarian Tapas in Madrid. 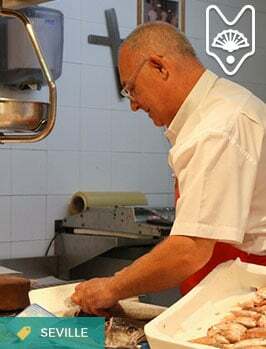 If visiting Madrid, join a vegetarian Madrid Food Tour and in Barcelona check out the vegetarian food tour in Barcelona –in the lovely Gràcia neighborhood. In Seville, check out the Ultimate Vegetarian Guide to Seville, and in San Sebastián, the Ultimate Vegetarian Guide to San Sebastian! And if looking for the best quality Spanish olive oils read my in-depth guide to Spanish olive oils)! So despite being famous for its ham and chorizo, Spain has a lot to offer vegetarian diners. And if you happen to eat fish and shellfish– well don’t even worry as your options are endless! 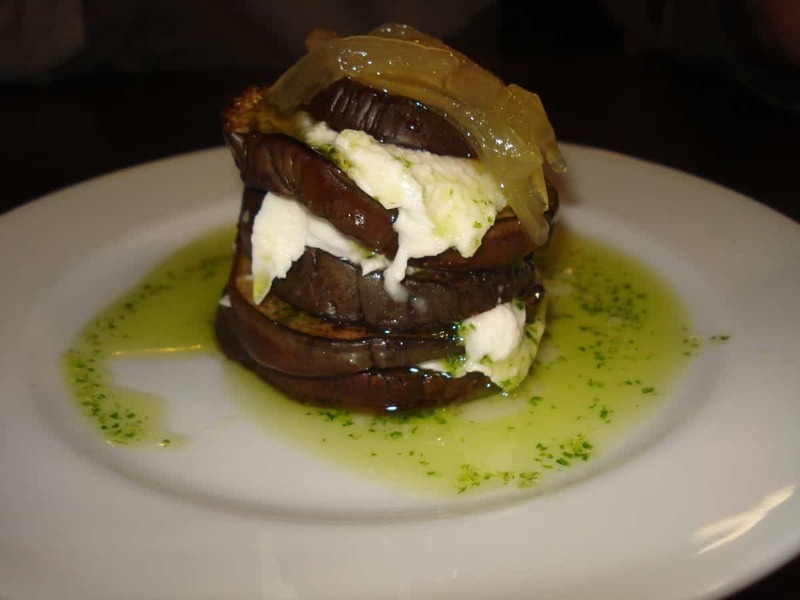 What is your favorite vegetarian food in Spain? Do any of the vegetarians reading this find it difficult to find options here in Spain? 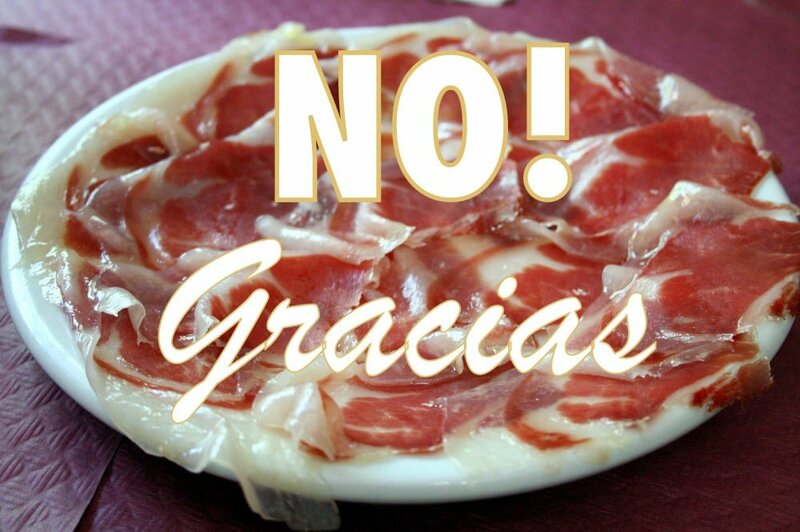 It’s true, Spaniards love their ham. I was always perplexed how it would be sanitary to be able to eat those salted hanging pig’s legs from every local restaurant as they have dangled there for years, oh well when in Rome I guess. I used to live in Barcelona and wasn’t to impressed with the food in general, but gazpacho is one of my favorite foods! Great post and awesome pics! That’s cured meat for you! I honestly think that unless you spend the big bucks, the larger cities of Spain actually have the worst food. At least that’s been my experience so far. In Andalusia I ate better than ever in my life, went out to eat 4+ times a week, and spent virtually the same as I would have cooking at home… crazy!!! great article we thought we were crazy that most of the food we had was terrible. especially the extremely funky seafood. but now im going vegan. any help here? cook and baker here thank you! I love how calamares del campo contain no calamares. Vegetarian is hard, but can you imagine being vegan? No eggs/milk/butter? I don’t know how they’d survive in Spain, unless they just never went out. I know! I love meat so I can’t even imagine being a vegetarian! But I love everything I mentioned in this article and try not to eat meat every day. Vegans have their work cut out for them when trying to eat out… but I’ve heard it is doable! Notables to add: queso teta con membrillo, pimientos de piquillo rellenos de queso or PAPAS BRAVAS. Mmm, I love all three of those Cat! The other day I bought some membrillo and it was gone within a week. So good! And that also made me think of fried pimientos de padrón, also amazing! Spain is so much more veggie than I thought…! Lauren, do u get indian veg food there ? Yes– lots of Indian restaurants in Madrid! Do they say “papas” in Andalucia or something? I think this is a great country for being a veggie in (though I´m not) and your options are fab! The berenjena, honey and salmorejo tip is at this very moment driving me crazy and I´ll be doing that thing you do with carrots very soon. I think it figures – a country where nobody produces or eats a variety of vegetables (Scotland, to my chagrin) pales into comparison with a country like Spain where vegetables are plentiful, varied and cooked with imagination. Well done, you! I’m glad you’ve showcased veggie options, especially since I’d never heard of some of these before. Calamares del campo cracked me up, and I too have put the carrot dish on the recipe bucket list. While eggplant always tempts, my other Spanish veggie favs are grilled setas, salmorejo, and marinated olives. PS. Have you ever tried calçots? I really want to try them! What are colcots? I must know!!! You must try them! My husband and i had them about 20 years ago in Masia Bou http://masiabou.com/cas/calcotada.php and we still talk about them. They sound delicious! I remember seeing them on Discovering Spain. I’ve actually tried them before– but in Mexico! They’re really good. I’ll have to try them here now too! Calçots are seasonal. Usually around February or March and don’t grow in Mexico. Exactly! (Though I’m not sure I understand your comment’s context?) Love calçots though! Great ideas!! Sometimes I’m at a loss when vegetarian friends ask me what they should eat in Spain, and these are definitely tasty alternatives!! 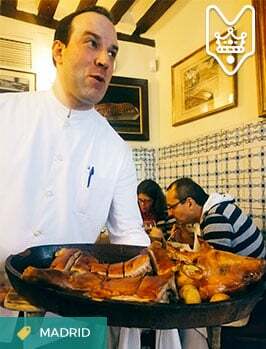 I used to live in Galicia and there they use a lot more fish, but jamón is still omnipresent! Great post and I am going to pass it on to a few veggie pals – they do get so little choice but dishes like this make up for it! Thanks Tanya! I think there are definitely a lot of good veggie options out there– you just have to do your homework and know where to go! I had a vegan cousin of mine visit me once in Spain, and he had decided that, rather than starve, he was going to have to eat some eggs/tortilla. As far as I know, there are no Spanish vegans, and very, very few vegetarians in general (I only know one). Thanks for this post! We are vegetarian and headed to Spain. Nice to have a handful of menu items that we can try that are also authentic! Thank you, thank you! You will love any of these! Where are you headed? Have fun!!! I am vegetarian and tend to cook at home, but I enjoy inventing in the kitchen and saving money so it isn’t so bad. I sometimes make a vegetable paella and in the winter make lentils with lots of veggies as well as garbanzos with spinach. I LOVE tortilla de patatas and had croquetas de espinacas y piñones last night! I have not seen the carrot dish, calamares del campo, or fried eggplant at a restaurant; I’ll have to try them when I do! I live 30km NE of Barcelona, where we call them Patatas Bravas (not Papas) and Catalan embutidos are much more common than cold soups. I tend to go to ecological stores to find things like quinoa, tofu, seitan, tempeh, and other specialty items. You can sometimes get stuffed grape leaves, hummus, and felafel at the abundant Turkish restaurants here. Apart from that, eating at restaurants can sometimes be frustrating. I found this especially true in the region of Asturias/León where we have family. Note: if you go to a restaurant and order un bocadillo vegetal it will likely have tuna. If you go to a friend’s house, they will likely make seafood as they Spanish concept of vegetarian only includes the exclusion of red meat. By the way, I gave a link to your blog in a recent post of mine. Hi my name is Hadas,I am a vegan, planning a trip to Madrid by the end of December . . I What is the name of the vegetarian restaurant you are talking about? or where it is?! Thanks! 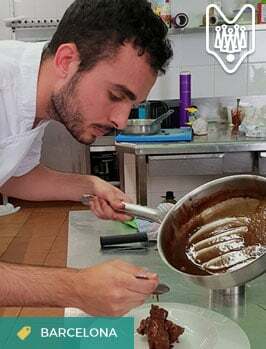 I have also found Spain offers a brilliant choice of food for tourists and residents – its an amazing hot pot of food culture which I always love exploring. One of my favourite places for vegetarian food have been Barcelona. check it out if you are a visiting vegetarian to Spain – you can search it by area and food type. I had a lovely version of a veg berenjas (sp?) aubergine in Meson don Felipe, by Waterloo station in London. Really it was just a lightly battered long slice of aubergine, with lime juice and salt. But God it was divine. Mercifully a whole plate of them were provided, nom, nom. In Seville, the first I visited, by sheer random chance I had rabo de toro. Bulls tail in a rich deep sauce. It was cheap, plentiful, rich and for a starving visitor perfect. The meat just fell away from the bone with no gristly bits. I’ve tried doing it at home, but it wasn’t as good. Watch out for the fee tapas. A favourite one to surprise the visitor is “callos”, which might be taken to be the attitude of the waiter, when you find it actually means tripe. Bleurgh. But other than that Spain has some of classiest and cheapest food in all of Europe. And what I like is that the waiters don’t ponce around you, interrupt your conversation with a prolonged attention demanding of the dish when they put it down or try to work tips. Its all very work man like, but high quality. You get this in France too but you have to go away from central areas. I once had oeufs en meurette at a worker’s cafe on the edge of the town centre in Beaune and it was marvelllous, 2 eggs cooked in red wine and herbs. A slab of bread and butter. And of course a glass of red wine. Ah regarding tortilla, if you fry one big potato and one onion in lots of oil gently for c 20 mins, then drain off the excess oil, add S&P to the potato onion mix, 2 eggs and mix gently. With some of the reserved decanted oil (1 tbspn) bring to heat and in a small, narrow frying pan (6-8 wide), pour half the potato mix in to hot oil, all the filling and the remaining potato mix. With an fish slice, press down into the frying pan. Turn heat to medium. Fry 3.5 mins. Take off heat. Place big plate on top. With big dish cloth/ tea towel, turn pan up side down. the contents will be lieing on the place. Add a spoon more oil to pan back on heat, slide tortilla into pan. Cook 3 more mins. Top with extra chopped parsley, woof it down. This dish is espec nice as its not overcooked and the filling can gently release its aromas rather than being turned to cardboard through overcooking/ dehydration. How long each side of the tortilla is done is a matter of experience of your cooker, the thickness of the tortilla. The white of the eggs should be cooked though. If the yellow is a little runny so much the better. I am glad I came across your blog, am planning a trip to Spain and wondering how the food scene will be(am a vegetarian). 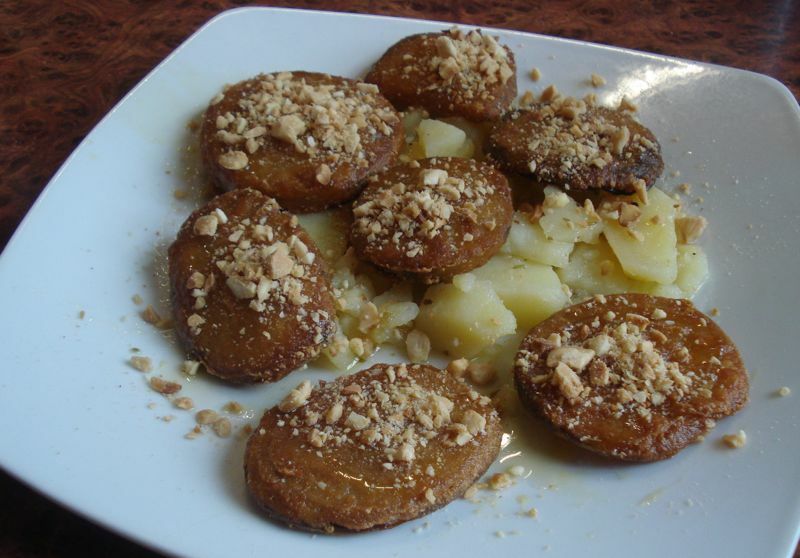 This page came as a relief, I do have a question, are these tapas dishes commonly available in most places in Andalucia? In many tapas bars across Andalusia you’ll find these tapas. But make sure you also explain that you are a vegetarian, and point out that you don’t eat ham or tuna (or any other fish). Sometimes people don’t realize that. Good luck! I just returned from Barcelona last week and am a vegetarian. I looked up vegetarian restaurants before I left and marked them on a map. There were at least a couple dozen of them all over town! Then wherever we were at lunch time, we’d find the closest place and eat. They were universal tasty and pleasant! We had a small kitchen in our apartment for 2 weeks so I could eat in for breakfast and dinner if the veggie options hadn’t panned out. We were two blocks from the Boqueria market and bought anything we needed there. It was amazingly fresh, cheap, and tons of variety of veg, fruits, nuts, dried fruit and more! We found it very easy to eat meatless there. I was in Barcelona several months ago and had a hard time finding plant-based options in restaurants (other than in the few specifically vegan outlets). Most of the vegetarian options contained cheese, mayonnaise, or eggs (or all three!) and went very heavily on the oil. Almost every salad or “vegetable” dish had eggs or tuna in it. Even tapas were difficult to find, other than bread with tomato, sauteed mushrooms with garlic (which I love), and olives. I did have asparagus (without the egg) and deep-fried eggplant with a sweet-and-sour sauce that was heavenly. Vegetable paellas were available almost everywhere, but I sensed a great disdain in the waiters for anyone ordering paella without meat or seafood, and I think the chefs must have felt the same, because none of those paellas were very tasty or well made, which was a disappointment. Despite the lack of restaurant choices, I was amazed at the lush and plentiful fresh produce (and nuts and dried fruits, etc.) in the markets. At least I could make my own incredible salads, and the variety of fruit was astounding! Thanks for the post!! I am not vegetarian and I love Spanish food, but I have to say it is quite hard to get enough vitamins and fibers in. It’s so much meat and fish and cheese and bread and deep-fried stuff. So I look for vegetarian restaurants when my body screams. Thanks again. You could add sopa the ajo to the list. Hi!The recipes are helpful, but eggs are not vegetarian. So half of these dishes don’t really work. Thank you for sharing the rest. In mid February, 2017, my wife and I finally took the leap and moved to Spain, renting a cave home from friends in Baza, Andalucia, while we look for our own place. We’ve been visiting Spain for about 30 years and while it’s got easier being veggie, especially nearer the coast, there are still a lot of dishes which have a bit of tuna or chorizo thrown in. My wife being Coeliac doesn’t help either, although there’s always tortilla and setas con alioli. But now we’re living here we can visit the wonderful local markets and stock up on fresh veg, beans and fruit, and cook them up back in the cave. When we arrived we drove up from Malaga and stopped for lunch at one of the excellent service stations that put most of the UK’s to shame and ordered Pisto con Huevos Fritos, which I’d read about in this article a just few weeks earlier, and it was just what we wanted, having flown out at 8am and not having eaten since breakfast. So I bought the ingredients on Baza market yesterday – asking for one aubergine but being told not to be silly, they were 4 for 1 euro, so take all these – and cooked it last night. I say it as shouldn’t, and my wife agreed, it was delicious, the egg goes perfectly with the vegetables. I’ll certainly be cooking it again, and will serve it when we have guests, one of those simple but effective Spanish meals. So happy to hear! It’s so easy to cook vegetarian/vegan/celiac at home in Spain– we are spoiled for choice! Would need to know that the deep-fried dishes hadn’t been fried in oil that had been used for frying fish or meat in as that makes it not suitable for vegetarians and on that one I wouldn’t trust it to be honest. thanks, that makes eating veg. food in spain a lot easier. Am a vegetarian from India. Better to do your homework before you land up in Spain.